Not Thad Bad came out towards the end of 2017. I also dragged my feet on picking it up/listening to it/reviewing it for a bit, so I didn't get it written up before the year ended. It's kind of a shame as this is one of those records that really should have been represented on my end of the year list and pretty high at that. 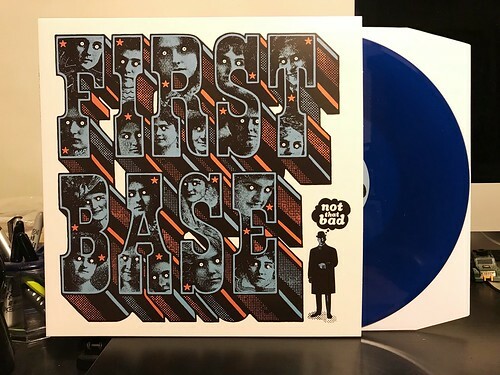 The way that the band rolls together their vintage guitar tones and power pop sensibilities, First Base has a hit on their hands. I actually got a little confused as I had thought I already owned band's first album, but doing a little bit of digging in the 'F' section and it turns out I don't, I only have a 7" of theirs that came out on La-Ti-Da. That missing LP seems like a pretty big omission to me, especially if their first one is anywhere near as good as this new record. I can be hit or miss on straight up power pop at the best of times, but First Base do a great job of keeping up the energy to go along with their bouncy hooks. The killer vocal harmonies certainly have a lot to do with how great all of the songs are as well, and it reminds me a lot of The Hum Hums maybe mixed with Gentleman Jesse or the Barreracudas first album. There is so much on this record for the garage power poppers to love, but there's also a lot here for the pop punkers out there as well. A damn fine album.